The spirit of Christmas arrives hand in hand with this charming little bear. Our ornament Lladró is accompanied by a porcelain crown minutely ornamented by Lladró artists and decorated with golden luster, matching the thread in the bear´s nose and mouth. The shine of the crown and the Teddy bear´s genuine alpaca in an intense blue colour plush convey a message of joy and warmth for the holiday season. Thanks to its ribbon, Lladró ornament can also be used as a Christmas tree decoration or to adorn our favourite corner at home. This Teddy bear is the result of a painstaking artistic process. 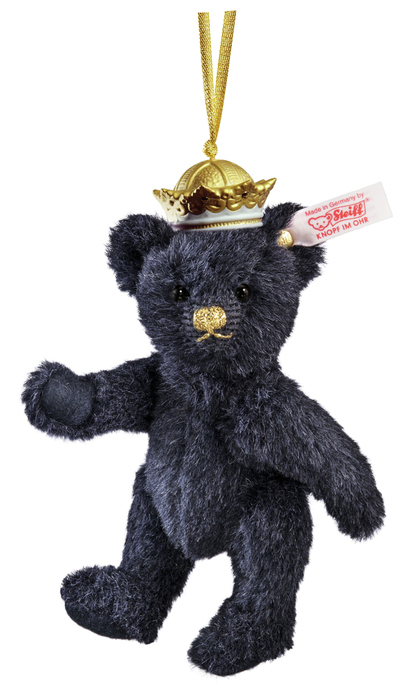 The prestige of Steiff Teddy bears is now coupled with the exclusiveness of the handmade Lladró porcelain, making this decorative Teddy bear a collectors´ item.